Denmark discovered the Cheesecake some years ago. It is pretty obvious that it’s still a new thing, ’cause you can’t walk into any self-respecting café without them having at least one kind of cheesecake on the menu. And I love it just as much (if not more) as the next carb-loving cake eater. But other than that, we have a proud Danish tradition of cakes of our own and we haven’t really adapted the whole pie culture – that is, until now. Say hello to The American Pie Company. In a little corner shop in one of the more fun streets of inner Copenhagen, you walk up a set of stairs and you open the door to where (to quote Agent Cooper from Twin Peaks) pies go to die. The room is small and is the love child of an American diner and a Nordic minimalistic decorated café. I do not know how they pulled it off, but it works. 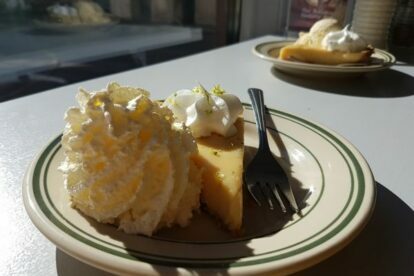 Go order the Key Lime Pie (remember to upgrade with a scoop of vanilla ice cream) or the banana pudding and the strongest americano you’ll get in inner city, grab a seat by the window and munch away. And if it’s not cake time yet (when is it not?? ), they have savoury pies as well. It’s not that cheap – but it’s damn good.